Being outside and falling asleep under the stars in a tent, while enjoying the crackle sounds of a bonfire, is by far one of the most enjoyable types of vacations. 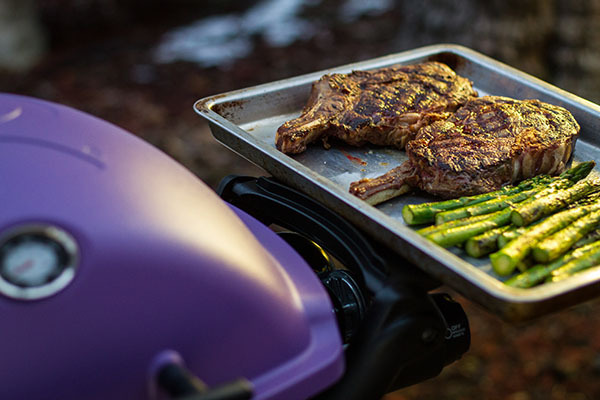 I think of camping and grilling as the perfect marriage because it’s an experience that resets the mind and allows the body to decompress, while giving the camper the opportunity to cook every meal on the grill with no real time restraints or pressure. 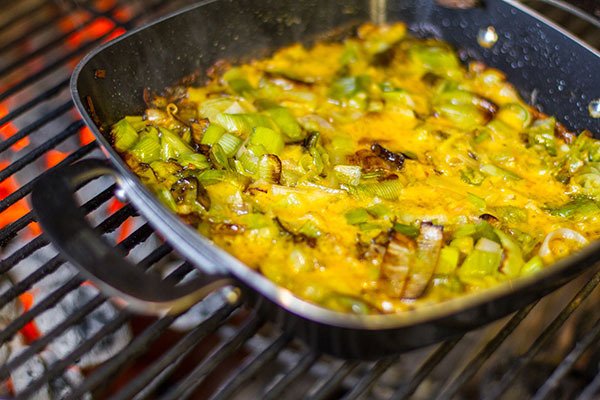 Today I’m going to talk through my top tips to consider for your next camping and grilling adventure. The biggest advice I can give anyone when embarking on a camping trip is to be overprepared with supplies. I always recommend writing out a check-list with every single item you will need, and then double checking it before you leave the house. Check-lists will ensure you don’t forget any important items, which will allow you to be successful. Everything from the Weber Grill, to the TP, to the ice for your cooler should be on the check-list. My two grills of choice for camping trips are the Weber Q2200 and the Weber Jumbo Joe. 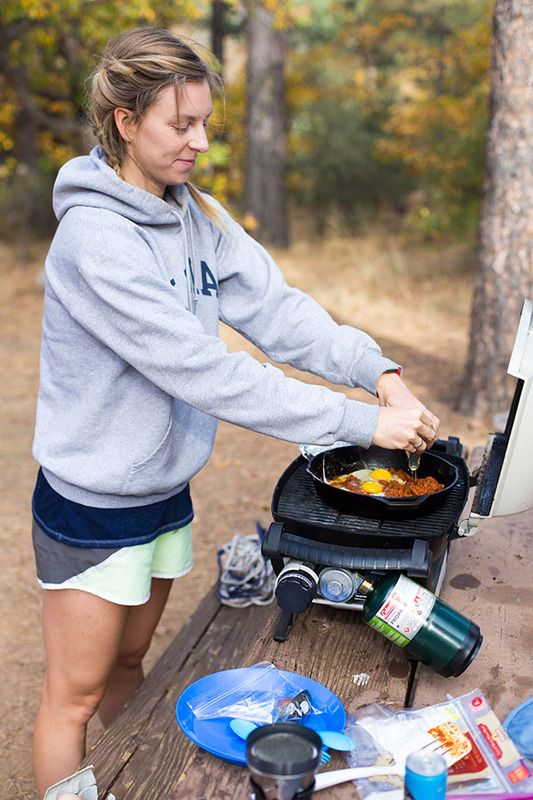 It’s important to read the campsite rules and regulations before deciding on which grill you pack because some areas of the country do not allow charcoal grilling. Both grills are perfect in size and have ample room for food. If you’re walking a long distance from your car to the campsite and are bringing a Weber Q, make sure to grab yourself a Weber portable cart. It works like grill luggage and makes transportation super easy. My favorite Weber accessory for camping are the Weber lighter cubes. These cubes not only get your charcoal lit quickly but they serve as excellent fire starters, even if they are wet. I bring a pack every camping trip, even if I’m not planning on cooking on charcoal! Other must have accessories include: tongs, spatulas, grill brush, and a griddle or plancha or a pan set for frying up some eggs in the morning. Whether you're bringing a gas or charcoal grill, it's important to bring extra fuel to ensure you don't run out. A 1-lb LP gas tank typically will run 1-1.5 hours on high, so I usually will have at least three tanks on hand for a long weekend of camping. Since the Jumbo Joe doesn't need a lot of charcoal, I recommend bringing 1 20-lb bag of Weber’s natural hardwood briquettes and you will be set for a long weekend. There are many great cooler brands that do a great job keeping cold things cold and hot things hot. I recommend having two separate coolers for your trips, one for food and one for drinks. Always pack your cooler with raw proteins on the bottom and fresh produce towards the top. It also doesn’t hurt to have a back-up bag of ice in the drink cooler in case you need to replenish the food cooler. Do majority, if not all of the food prep at home. Slice all the vegetables, prepare and portion out the proteins, and store food in double zip-lock baggies for easy clean up. I like to keep my food options relatively basic when camping. One of my favorite camping foods is a gourmet burger. My preferred blend is a ground chuck, bacon, and brisket burger. 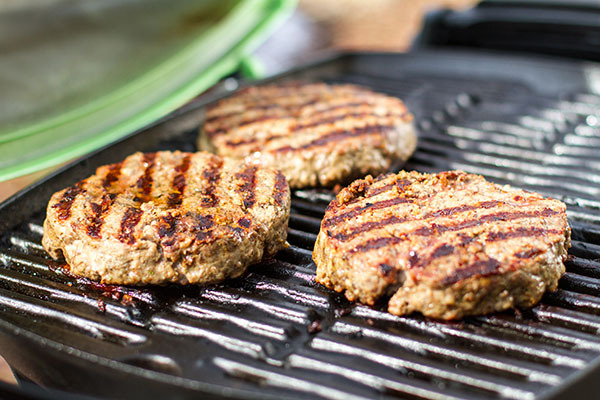 I mix the ground meat with salt, pepper, garlic, and Worchester sauce, and then form 1/4-lb patties into ¼-inch thick burgers. I top the burgers with cheddar cheese and a fried egg and serve on a toasted pretzel bun. My favorite side for this is grilled potato spears with salt and pepper. When grilling with charcoal, keep in mind the proper way to dispose of ash. The best way to dispose of your ash is to completely cool down the grill first by closing all the dampers on the grill and then waiting a couple hours for the ash to cool. After the ash is completely cooled down you can dump it into a heavy-duty garbage bag and dispose in the trash. Don’t forget to add at least 5 garbage bags on the check-list, they always come in handy!